In the early 1980's, much as today, the Rocky Mountain Region was experiencing a boom in oil and gas production. As many as 60 Denver-based attorneys were devoting much of their time to the preparation of drilling, division order and security title opinions covering lands across the Rocky Mountain Region, as well as many other Mid-Continent states. Although most of these title opinions were prepared from title abstracts, stand-up records examinations in county recorders' offices were commonplace. Because a mineral title examiner needed to stay current with changes in the law in these many states, it occurred to Richard H. Bate, a Denver-based mineral title examiner, that time spent independently updating laws affecting title could be better utilized if title lawyers shared their research, and that quarterly meetings at which title attorneys would provide updates of case law and statutes for various jurisdictions would be much more efficient. Richard, with the assistance of Ken Willis, invited the mineral title examiners he knew to discuss establishing an organization that would help meet the legal research needs of mineral title examiners. Word spread quickly, and more than 70 lawyers attended the initial meeting Richard proposed. A legal update format was developed, and at each subsequent meeting - initially a tradition over Monday dinner - participating lawyers volunteered to provide their fellow mineral title lawyers with a report containing recent changes in statutory, jurisprudential, and administrative law changes for a particular jurisdiction. As an added benefit, these gatherings of mineral title lawyers offered an opportunity to network and to exchange information about the practical aspects of the mineral title examination process with other lawyers practicing in the same field. 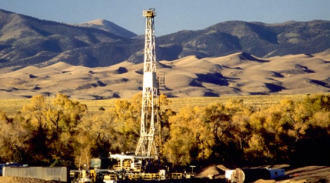 At present, meetings of the Denver Association of Oil and Gas Title Lawyers are held tri-annually. Members volunteer to provide reports concerning new statutes, cases, and administrative rules and regulations in the following jurisdictions: Colorado, Wyoming, Utah, Montana, North Dakota, Texas, Kansas, and Nebraska. Denver Association of Oil and Gas Title Lawyers members receive valid Continuing Legal Education (CLE) general credits, with opportunities to earn both general and ethics credits. In addition, Denver Association of Oil and Gas Title Lawyers members also receive full access to this website, which includes a membership contact information directory, electronic mineral title examination forums, useful links, and an archive of past jurisdiction reports from members.